It’s at times like these that one gets to know who one’s true friends are. Huge thanks for all the kind and supportive messages received over the past few days. I am still waiting for proof – one SINGLE proof – of allegations made against me. So far, nada. There was, however, enough proof to find lawyer Mark Lewis guilty of bringing his profession into disrepute. In a report published yesterday, the Jewish Chronicle predictably claimed I was one of his “attackers”. Poor man. In the warped minds of certain hacks, being asked questions in a civil manner equates to being “attacked”? Twice in the space of less than a week, this same publication has also stated that I was given a “two-year suspended sentence”. As one good friend notes: would that be illiteracy, ignorance, or a wish to mislead? Oh well, at least the JC can be said to act in the tribal interests of its readership. A reliable source informs me that last Monday’s LBC radio phone-in with Muslim Zionist, Maajid Nawaz, featured a call from a disillusioned serving police officer who stated that his force had been obliged to arrest someone for singing a song. Who could that be, I wonder? November 2016, bare-faced liar and useful idiot for the Israel lobby, Suzanne Fernandes, managed to have an officer from Derbyshire Constabulary arrest me – the officer told me he was acting on behalf of Essex Police – for alleged harassment. Fernandes falsely accused me of targeting her and her children on Twitter. I was never asked to answer bail and the charges against me were dropped. Indeed, Fernandes regularly posts photos of her young children online – most recently as her Twitter header. One may be forgiven for concluding that professional victims like Fernandes use their own kids as bait. She’s certainly not the only one. Twitter Support has now come up with a THIRD different reason for my suspension. Firstly, they claimed I was guilty of posting a ‘violent threat’. Secondly, they claimed I was guilty of creating multiple accounts with overlapping purposes. Now, they claim my account was suspended for ‘multiple breaches of Twitter rules’. None of these reasons has any validity, clearly confirmed by the fact that Support has now given three, separate reasons for a suspension which was originally the result of malicious, mass reporting by users who are themselves in breach of Twitter rules! Regulars here on my blog will remember my suspension from Twitter last October, followed by Derbsyhire police closing their investigation into the harassment and malicious communications of which I am victim, and then my arrest by the same police force two weeks later. As you can see, there are two police forces tagged into my offending tweet. Previously, during the targeting of my gigs, venues, my Edinburgh Fringe show and the general trolling and harassment of me by this same troll and others, @Sicaro72’s tweets had been sent to police on their request. Back then, although I knew of Sicaro’s other identities, including those mentioned in my above reply AND the infamous @NemoNemo50 – still no official charges! – I still had no idea who he was in real life. Maybe because the threat was separated over two tweets (the order is reversed in the image above) Twitter doesn’t consider it a threat? 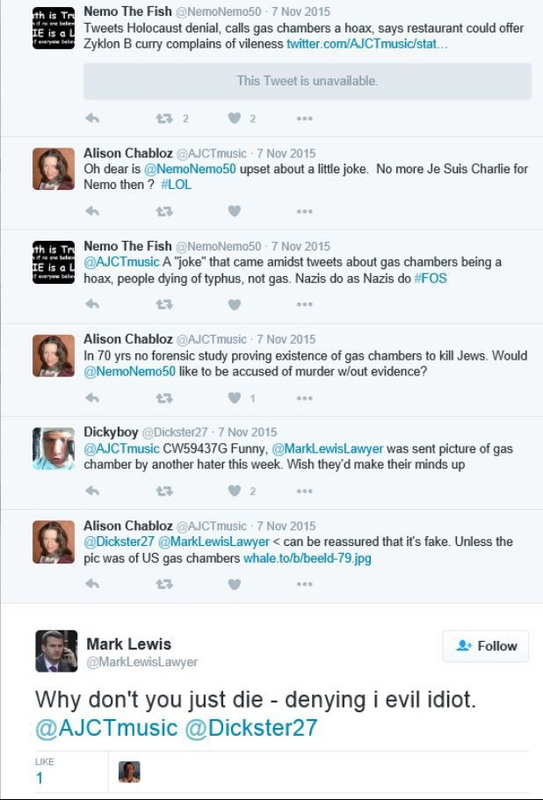 And what about CAA (Campaign Against Antisemitism) associate Mark Lewis’ replies to me? Whereas I tweeted once only about wanting to see a rope around an anonymous serial troll’s neck, foul Lewis is able to get away with tweet-murder, and his only sentence is to remove his crass outbursts. How does Twitter Support reconcile such blatant double standards? As for the poor, strangled troll, Sicaro aka Nemo, I made an Excel spreadsheet of the 540 tweets he’d sent me over a period of six months and sent this to Twitter Support who, after this grand effort on my part, finally suspended him. Why my prior, endless reports didn’t have the same effect is a mystery. Regards Sicaro’s 540 tweets, my own suspension and Lewis’ non-suspension, I appealed to Support again and, suddenly, rather than citing a ‘violent threat’, the reason given for my suspension was now the ‘creation of multiple accounts with overlapping purposes’. To no avail… The new excuse lasted a couple of appeals and then reverted back to the ‘violent threat’ yarn. I tried opening a new account @ajchabloz last week and was not able to send one single tweet before being suspended for ‘multiple breaches of Twitter rules’. It’s so absurd, that it’s laughable. Banned for a ‘violent threat’ – simply words in a tweet – whereas my abusers are given free reign to troll, harass, threaten and stalk with impunity, mostly using anonymous accounts. Twitter clearly uses one set of rules for a certain section of the Twitter community – those associated with ‘anti-racism’ [sic] organisations – and another for the rest of us. Sicaro aka Sicko aka Nemo is back up to his usual tricks as mark00427586, tweeting about George Galloway and grassing up anyone he dislikes to CST and CAA: ‘I don’t work for any charities’, come the habitual, Talmudic lies. He can’t be too vocal, though, and he knows why. It was only after my first court appearance on December 15 that I came to the realisation that the two men – CAA Chairman and Director of Enforcement – sitting next the prosecution lawyers were none other than my two most prolific trolls, Nemo and Bedlam. There was no need for any confirmation from me: their solicitor managed this, dragging my barrister and I back across the UK a week later when Goldberg QC lied in order to have me gagged by fellow Friend of Israel, the now-recused Chief Magistrate, Emma Baroness Arbuthnot. There are enough screenshots of the two CAA director-trolls hosted on this very blog and included in attachments to police emails without it being necessary to recover the library of screenshots on my computer – the same computer held for five months without a charger and which has still not been returned to me, despite all police charges being dropped. The only two or three charges left are for my songs, and I’ve not yet been served with those either. No wonder the CPS asked for an adjournment and no wonder CAA have stopped mentioning my name – the first time in what was a daily occurrence for over 18 months. The CAA is, however, still targeting others. One latest victim is Welsh Labour hopeful Mike Sivier, rightfully angry after he suffered defeat at last week’s local elections following a typically rampant CAA smear campaign. Unable to crucify Sivier properly on their own blog, CAA paid a useful hasbara and one of Sivier’s Tory rivals to seal his fate by associating him with yours truly. I shall write more on this in another blog post. Suffice it to say that we ethnic Brits are being silenced, as well as professionally and socially demonised in our own country. Not all the culprits are of foreign heritage, some are as British as Sivier and I – and they’re the worst traitors of all, along with our corrupt political leaders who have enabled this and allowed it to happen beneath their very eyes. This isn’t what our fathers and forefathers fought for. Time to wake up! Yes, regarding the CAA and my other accusers I will be making a counter-claim and, depending on the result, I will also be making a claim against Twitter. In light of the above evidence, it’s difficult to see how they would have a twig a tweet on. I will publish a copy of Twitter’s response to my appeal below. Ethnic Europeans are being discriminated against in their own lands by minority groups. We only have to look at the recent disbarring of Ian Millard by the UK Bar Standards Board, as well as several high profile suspensions – including my own – from Twitter, to understand that there is no other explanation. Time to wake up and to start fighting back. Today, it’s Millard, Vaughn, Yiannopoulos, Frith and Chabloz. Tomorrow, it’s you. Blatant double standards of corporate social media groups are easily explained by looking at who owns these platforms and by observing which groups can use them to smear, threaten and abuse with impunity and which groups cannot. Can someone in London or Dublin please perform a quenelle outside Twitter‘s offices? 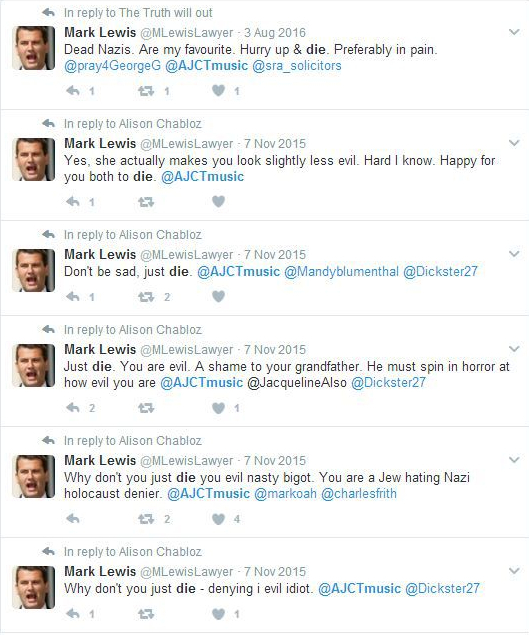 If Twitter – and indeed the Solicitors Regulation Authority – are quite comfortable with Zionist lawyer Mark Lewis‘ public outbursts, then what harm in an anti-establishment comic salute ou deux? Why do abusive Zionists need protecting when, clearly, it’s us who need protecting from them? Just as the illegal Israeli government continues to ethnically cleanse Palestine of native Arabs, so the international Zionist lobby aims to do the same to ethnic white Europeans in Europe and in every other part of the world inhabited by Europeans. Progressive minds are not fooled by duplicitous, conniving, western mainstream media. Our parasitic controllers are very scared indeed. More and more people are waking up to the incontrovertible truth that they are the ones behind the immigrant invasion of Europe. In fact, more and more people are now realising that Jew-Zionists are pretty much responsible for all the evil that exists in the world today. They have elevated themselves to positions of importance in finance, government, media and law. Laws are implemented in order to protect Zionist interests at the expense of our own nations, culture and heritage. Speaking or writing about these facts is not ‘hate speech’ or ‘persecution’. It’s the plain truth: it’s happening in front of our own eyes. ‘Diversity’ will eventually mean no diversity: white genes are recessive and white Brits are already a minority in the UK capital. Being a white nationalist doesn’t mean other groups deserve to be hated. It’s the most natural thing in the world to want to protect and cherish one’s own kind. We need to start behaving in the same way ethnic minority groups behave in a foreign country and take back control. Zionist-run media i.e. every title going – isn’t going to stick up for the interests of ethnic Brits. Neither are the treasonous hordes of SJW Shabbos Goy. If you’re still wringing your hands at any mention of the far right, just remember that Margaret Thatcher was elected after the Tories stole policies of the National Front. Theresa May has now done the exact same with UKIP policy. Remember, too, that 17.4m Brits voted for Brexit. If you do not feel concerned about our basic freedoms being abused then perhaps the time has come to ask yourself why. Rather than pointing the finger at patriots, artists and academics and repeating ad nauseum the same Zionist buzzwords, isn’t it time you started defending your own origins, your own people and your own cultural and spiritual heritage, rather than those of a belligerent, hostile tribe?